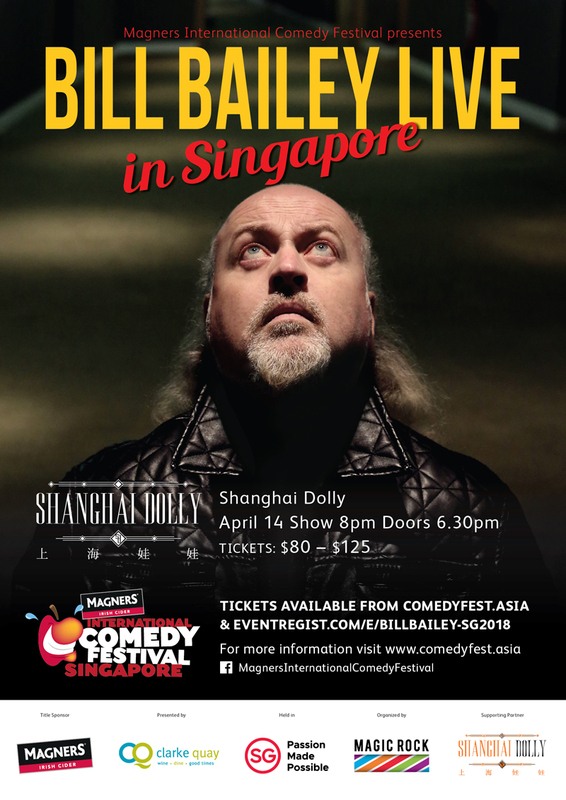 Comedian musician Bill Bailey is holding his brand new Live in Asia Tour 2018 on 14 April 2018 at Shanghai Dolly, Clarke Quay as part of the Magners International Comedy Festival. Coincidentally, it also the club's final night as Shanghai Dolly will shut its doors at Clarke Quay at the end of the week! Bill Bailey Live in Asia 2018, a compendium of travellers’ tales and the general shenanigans of twenty years as a travelling comedian, will feature new material gathered from his tours and encounters over the last year. He kickstarted his Asia Tour in Ho Chi Minh, followed by Bangkok, Pattaya, Phuket and Shanghai with his last stop in Singapore. With brand new material interlaced with Bill Bailey’s signature musical virtuosity, surreal tangents and trademark intelligence, Bill Bailey tackles politics, philosophy and the pursuit of happiness. Tickets for Bill Bailey Live in Asia Tour 2018, priced between $80 to $125, are available at www.comedyfest.asia and are selling out fast. Bill Bailey Live in Asia Tour is brought to you by Magic Rock Pte Ltd.